Attorney Myron Watson has been in private practice for more than 20 years, specializing in criminal trial law, in both State and Federal Courts. In his legal practice, he has been involved in several high profile criminal cases which received both local and national media attention. He is truly dedicated to his clients and will fight the tough legal battles to achieve the best result for his clients. 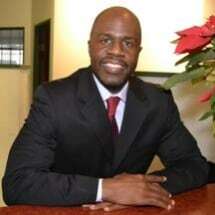 Attorney Myron Watson is a native Clevelander and a graduate of East Cleveland School System. Being from this area, he knows the people and the legal terrain of this region well. He is a proud graduate of Cleveland State University, where he majored in Political Science. From there, he attended and graduated from Law School at Howard University in Washington, DC. After graduating from law school, he became an associate attorney at Willis Blackwell and Rogers before entering in private practice. While being a sole practitioner, he has built a thriving practice, and is recognized as one of the most respected criminal trial attorneys in Northeast Ohio. Many inside and outside the field of law consider Attorney Watson’s trial work outstanding. He is also involved in volunteer work for a number of civic organizations in the Greater Cleveland Area. Myron P. Watson, Attorney at Law handles criminal defense and personal injury cases in Cleveland and across Northeastern Ohio.